Home / Latest TBV News / Let the Showdown begin! Showdown’s impact on Victorian breeding was profound and he deserves the honour of having the VOBIS Sires $1 million race named after him, writes DANNY POWER. Studmaster George Smith remembers the day he first laid eyes on Showdown. 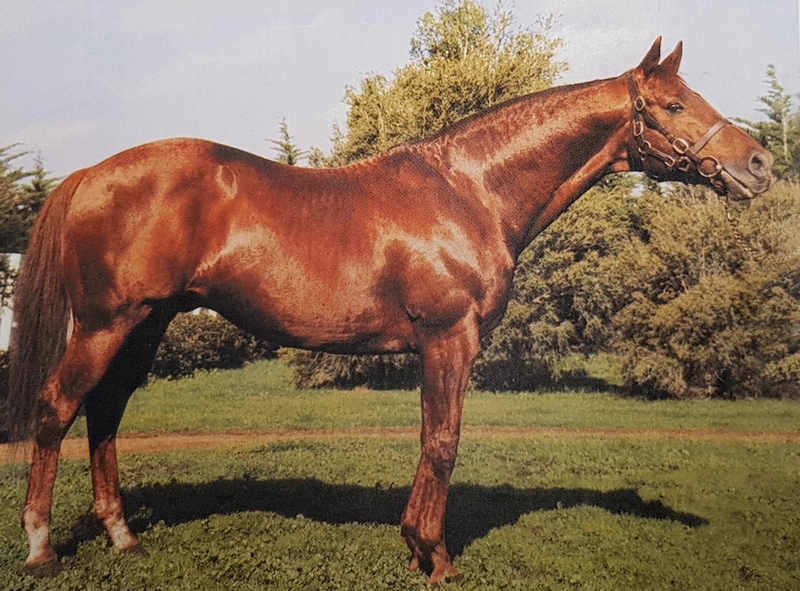 The chestnut stallion stepped off a float at Stockwell Stud where Smith was the stud manager. It was the winter of 1966 and the English horse was everything he expected. Smith wasn’t involved in the purchase of Showdown, it was another, more famous Smith—champion Sydney trainer TJ (Tommy) Smith—who travelled to England with Stockwell Stud’s owner, Melbourne businessman Ken Cox, to inspect the brilliant sprinter-miler. Cox wanted an English stallion with speed to suit the developing speed-oriented Australian market after he’d offloaded the staying stallion Arctic Explorer (GB) to New Zealand, albeit before his most famous son, the champion Tobin Bronze, had hit the tracks in 1965. “Arctic Explorer only got only 11 mares (in season 1964), so when the New Zealanders made an approach to buy him, naturally we sold him,” George Smith, 84, said. Smith laughs at the thought that had Tobin Bronze arrived a year earlier, Cox might not have sold him and been looking for a replacement stallion. Showdown came on the market despite having a race career that should have seen him snapped up by an English stud farm. However, his sire Infatuation (GB) (by Nearco), despite winning the 1953 Group 1 Dewhurst Stakes (2YOs, 1400m), was a flop at stud and sold off to Japan. Showdown, trained by Fred Winter snr, like his sire was up and running early, winning four of his five starts at two in 1963, including the Group 1 Middle Park Stakes (1200m) and the Group 2 Coventry Stakes (1200m), at Royal Ascot. Timeform gave him a rating of 133. At three, Showdown struggled to recapture his juvenile form, but he hit back at four to win the Group 1 Queen Anne Stakes (1600m) at Royal Ascot, which earned him the title of England’s leading miler of 1965. Cox offered $80,000 (more than $1 million in today’s dollars) for Showdown, which was rejected, and he left for home disappointed and without a horse. Three months later, with the help of the British Bloodstock Agency and Bill Stutt, from Melbourne’s Wright Stephenson & Co, the deal was done and stallion was syndicated with Cox taking 10 of the 40 shares. Not everyone was as happy as George Smith when Showdown arrived in Australia. Leading breeder Harry McNamara, from Werribee, didn’t like him at all, and got a refund on his share. Ironically, it was McNamara who bred and sold Showdown’s greatest offspring, the flying filly Dual Choice, who was from the stallion’s first crop. Although Churchill might have found flaw in the physical comparisons between Showdown and Star Kingdom, when the stallion’s first crop stepped out in the early 1969 spring, the results were just as astonishing as in 1954 when the first Star Kingdoms dominated the early 2YO races. In early October, the first juvenile race of the season in Melbourne was the Maribyrnong Trial (900m) at Flemington—Showdown’s gelding Prodromus (out of Forego) won the C&G division while his daughter Dual Choice (out of Unit) trounced her rivals in the fillies’ division. A week later, Dual Choice brilliantly won the Debutante Stakes (800m) at Caulfield and she returned in the autumn to win the Merson Cooper Stakes (1200m) at Caulfield, which at the time was Victoria’s premier race for 2 year-olds. Dual Choice was to prove the best sprinting filly Australia had seen for years. At three, she won the Group 2 Freeway Stakes (1200m) at Moonee Valley, the Group 2 Ascot Vale Stakes (1200m) and Group 2 Edward Manifold Stakes (1600m) at Flemington, and then outgunned the colts in the Group 1 Caulfield Guineas (1600m, Caulfield) before capping off a massive campaign by winning the Group 1 Craven A Stakes (1200m), against all comers, at Flemington on the first day of the Melbourne Cup carnival. While that was happening, Showdown’s stocks were boosted even further when two sons trained by Tommy Smith, Silver Sharpe and Royal Show, emerged as the best of their age as Classic-contending 3 year-olds in the 1970 spring. Royal Show (out of Melbourne Cup winner Wodalla’s half-sister Joelma) was the better of the two—he had finished second behind Baguette in the Golden Slipper—although Silver Sharpe (out of Snowline) won the AJC Derby and Victoria Derby double. Royal Show beat the older horses at weight-for-age in the Group 2 Warwick Stakes (1400m) at Warwick Farm before winning the Group 1 Canterbury Guineas (1900m, Canterbury) and Group 1 Rosehill Guineas (2000m, Rosehill), but Silver Sharpe had his measure beyond 2000 metres. Showdown’s stud career was on a stellar rise. His fee jumped to $4000, and by 1978, after his star youngsters Tontonan (a brother to Prodromus) and Toy Show—both owned or part-owned by Cox—won the Golden Slipper in 1973 and 1975 respectively, Showdown’s fee skyrocketed to a Victorian record $12,000 in 1978 – the equivalent of about $60,000 in today’s dollars. He died in 1985 having sired 46 Stakes winners from a stud career during which 60 mares was a full book. It’s fitting that the $1 million Showdown (1200m)—to be run in April this year for 2 year-olds under the rich VOBIS Sires’ scheme for the progeny of nominated Victorian stallions—will honour a horse that can lay claim to be Victoria’s greatest stallion. NEXT POST: Greta West’s Autumn prospects, ticking along nicely!